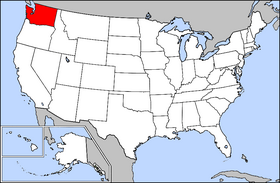 Washington is a state in the Pacific Northwest of the United States. The state capital is Olympia and the largest city in Washington is Seattle. As of the 2000 census, the state population was approximately 5.9 million and the state work force numbered about 3.1 million. Residents are called "Washingtonians" (emphasis on the third syllable, which rhymes with bone). Washington is the only state named after a president, who was George Washington. The battleship USS Washington was named originally for President Washington, but was later renamed in honor of the state. Washington is bounded by the Pacific Ocean to the west, Oregon to the south (the Columbia River forming most of this border), Idaho to the east and British Columbia, Canada to the north. It is famous for scenery of breathtaking beauty and sharp contrasts. High mountains rise above evergreen forests and sparkling coastal waters. Its coastal location and Puget Sound harbors give it a leading role in trade with Alaska, Canada, and the Pacific Rim. Puget Sound's many islands are served by the largest ferry fleet in the United States. Washington is a land of contrasts. The deep forests of the Olympic Peninsula are among the rainiest places in the world and the only rainforests (such as the Hoh Rain Forest) in the continental United States, but the flat semi-desert that lies east of the Cascade Range stretches for long distances without a single tree. Snow-covered peaks tower above the foothills and lowlands around them. Mount Rainier, the highest mountain in the state, appears to "float" on the horizon southeast of Seattle and Tacoma on clear days. The eastern side of the state can be divided into two regions: the Okanogan Highlands and the Columbia River Basin. Prior to the arrival of explorers from Europe, this region of the Pacific Coast had many established tribes of Native Americans, each with its own unique culture. Today, they are most notable for their totem poles and their ornately carved canoes and masks. Prominent among their industries were salmon fishing and whale hunting. In the east, nomadic tribes travelled the land and missionaries such as the Whitmans settled there. 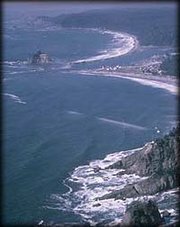 The first European record of a landing on the Washington coast was by Spanish Captain Don Bruno de Heceta in 1775 on board the Santiago, part of a two-ship flotilla with the Sonora. They claimed all the coastal lands up to the Russian possessions in the north for Spain. In 1778, British explorer Captain James Cook sighted Cape Flattery, at the entrance to the Strait of Juan de Fuca, but the straits would not be explored until 1789 by Captain Charles W. Barkley. Further explorations of the straits were performed by Spanish explorers Manuel Quimper in 1790 and Francisco Eliza in 1791, then by British Captain George Vancouver in 1792. The Spanish Nootka Concession of 1790 opened the northwest territory to explorers and trappers from other nations, most notably Britain and then the United States. Captain Robert Gray (for whom Grays Harbor county is named) then discovered the mouth of the Columbia river and, beginning in 1792, he established trade in Sea Otter pelts. In 1805 the Lewis and Clark expedition entered the state on October 10. In 1819 Spain ceded their original claims to this territory to the United States. This began a period of disputed joint-occupancy by Britain and the U.S. that lasted until June 15, 1846 when Britain ceded their claims to this land with the Treaty of Oregon. Due to the migration along the Oregon Trail, many settlers wandered north to what is now Washington and settled the Puget Sound area. The first settlement was New Market (now known as Tumwater) in 1846. In 1853 the Northern Pacific railroad line reached Puget Sound, linking the region to the other states. During that same year Washington Territory was formed from part of Oregon Territory. Early prominent industries in the state included agriculture and lumber. In eastern Washington the Yakima Valley became known for its apple orchards while the growth of wheat using dry-farming techniques became particularly productive. The heavy rainfall to the west of the Cascade Range produced dense forests and the ports along Puget Sound prospered from the manufacturing and shipping of lumber products, particularly the Douglas fir. Other industries that developed in the state include fishing, salmon canning and mining. By the turn of the 20th century the state of Washington was one of dangerous repute in the minds of many Americans. Undisputably as "wild" as the rest of the wild west, the public image of Washington merely replaced cowboys with lumberjacks, and desert with forestland. One city in particular, Aberdeen, had the distinction of being "the roughest town west of the Mississippi" due to excessive gambling, violence, extreme drug use and prostitution (the city itself changed very little over the years and remained off-limits to military personnel well into the early 1980's). For a long period Tacoma was noted for its large smelters where gold, silver, copper and lead ores were treated. Seattle was the primary port for trade with Alaska and the rest of the country and for a time possessed a large ship-building industry. The region around eastern Puget Sound developed heavy industry during the period including World War I and World War II and the Boeing company became an established icon in the area. During the depression era a series of hydroelectric dams were constructed along the Columbia river as part of a project to increase the production of electricity. This culminated in 1941 with the completion of the Grand Coulee Dam, the largest in the United States. During World War II the Puget Sound area became a focus for war industries with the Boeing Company producing many of the nation's heavy bombers and ports in Seattle, Bremerton, and Tacoma available for the manufacturing of ships for the war effort. In eastern Washington the Hanford Works atomic energy plant was opened in 1943 and played a major role in the construction of the nation's atomic bombs. In 1980, following a period of heavy tremors and eruptions, the northeast face of Mount St. Helens exploded outward, destroying a large part of the top of the volcano. This eruption flattened the forests for many kilometers, killed 57 people, flooded the Columbia River and its tributaries with ash and mud and blanketed large parts of Washington in ash, making day look like night. The state is literally split down the middle politically, with Eastern Washington firmly in the hands of the Republican Party and Western Washington, especially around Seattle, firmly in Democratic hands. Since the population is larger in the west, the Democrats usually fare better statewide. Although nationally, Washington is not usually a major force in politics, in 1994, Washington was one of the places where the Republican Party gained power in their nationwide landslide. Republicans won six of the eight House of Representative seats held by Democrats and Republican Slade Gorton held on to his Senate seat. Washington has voted for the Democratic candidate in presidential elections recently in 1988, 1992, 1996, 2000 and 2004. It was considered a key swing state in 1968 and 2000. In 1968, it was the only Western state to give its electoral votes to Hubert Humphrey. In 2004, John Kerry won the state's 11 electoral votes by a margin of seven percentage points with 52.8% of the vote. In 2004, Washington's gubernatorial race was so close that the Secretary of State certified Republican candidate Dino Rossi as governor-elect almost a month after the polls had closed, beating out the Democratic candidate Christine Gregoire by just over two hundred votes. Due to the small margin of victory, a machine recount (required by law) took place and, by a margin of only 42 votes out of more than 2.8 million cast, Rossi won again. However, the Democrats requested a final hand count of the votes. Gregoire ended up winning this count by 129 votes and was inaugurated on January 12, 2005. The subsequent court battles raged for months after the election, but ultimately ended with Gregoire retaining her office. The final official count left Gregoire ahead by 133 votes. Washington has the distinction for being the first and so far only state to elect women to all three major statewide offices at the same time, both Senators and the Governor. Washington has an extensive system of state highways, called State Routes and the third largest ferry system in the world. 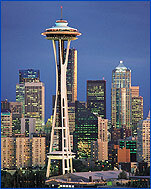 According to the U.S. Census Bureau, as of 2004, Washington's population was 6,203,788. This includes 631,500 foreign-born (10.3% of the state population), and an estimated 100,000 illegal aliens (1.6% of state population). The five largest reported ancestries in Washington are: German (18.7%), English (12%), Irish (11.4%), Norwegian (6.2%) and Mexican (5.6%). As with many other western states, the percentage of Washington's population identifying themselves as "non-religious" (an umbrella term which is sometimes synonymous with or includes elements of atheism, agnosticism, skepticism, freethought, humanism, secular humanism, heresy, logical positivism, and even apathy) is much higher than the rest of the U.S. The percentage of non-religious people in Washington is the highest of any state, and church membership is among the lowest of all states. The 2003 total gross state product for Washington was $244 billion, placing it 11th in the nation. The per capita income was $33,332. Significant business within the state include the design and manufacture of jet aircraft (Boeing), computer software development (Microsoft, Amazon.com, Nintendo of America), electronics, biotechnology, aluminum production, lumber and wood products, mining, and tourism. The state has significant amounts of hydroelectric power generation. Significant amounts of trade with Asia pass through the ports of the Puget Sound. For 2001, the total value of Washington's agricultural products was $5.4 billion, the 12th highest in the country. The total value of its crops was $3.2 billion, the 8th highest. In 2002 Washington ranked first in the nation in production of raspberries (87.8% of total U.S. production), hops (74.4%), spearmint oil (also 74.4%), wrinkled seed peas (65.6%), apples (60.2%), Concord grapes (51.8%), sweet cherries (48%), pears (44.9%), lentils (41.9%), peppermint oil (35.2%), carrots for processing (34.5%), tart cherries (32.8%), Niagara grapes (32.4%) and sweet corn for processing (29.2%). Washington also ranked second in the nation in grapes (all varieties taken together), apricots, asparagus (over a third of the country's production) and green peas for processing; third in the nation for wheat, prunes and plums, summer dry onions, trout and butter; fourth in barley and peaches; and fifth in cranberries and strawberries. Washington's newest state symbol is the orca. In a effort led by second and third grade students from Crescent Harbor Elementary in Oak Harbor. Pods of orca are resident in Puget Sound and the surrounding waters of the Pacific Ocean. Orca and other whale watching tourism brings in millions of dollars of revenue to the state. It is a culturally significant symbol for local tribes of Native Americans. Designation of the orca as the state marine mammal is also an attempt to raise awareness in protecting it's habitat.